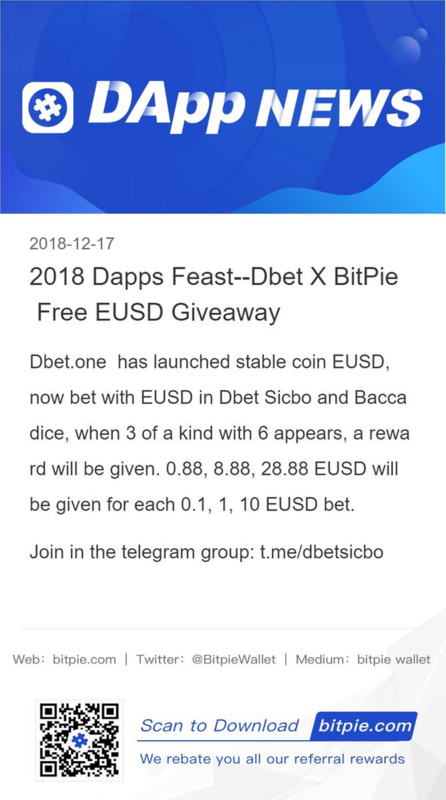 Bitpie initiates the “DApp Feast” Bet with stablecoins, you’ll receive extra giveaways! To date, 7 dapps in our Feast! More to Come this week!! The Top Prize is $45,000! and 7 iPhone Xs Max are given out! BetSand, the first “European Roulette “game under EOS Blockchain. A one stop Game Center. The top 3 winners will be decided by the players who bet with EUSD and make the most profits from their game play. EOSJacks is an Innovative Decentralized Gaming Platform featured with multiple games including BlackJack, Ladder Race, Ladder PvP and Dice and more up to come games. EOSPoker.win is the first ever decentralized poker gaming platform on the EOS blockchain. It is provably fair and totally transparent. Two games have been launched on the platform: Blackjack and three card poker. it is owned by the community of POKER holders. Tobet.one Gaming game platform based on EOS blockchain. You’ll get 1 EUSD reward from rolling 66 and 88. BETX.FUN is an innovative Pos dividends, 0 fundraising pure mining game platform. For each bet 1EOS equivalent token, the roll number is 8. Reward 0.2EUSD! For each bet 1EOS equivalent token, if the roll number is 88, reward 0.4EUSD! 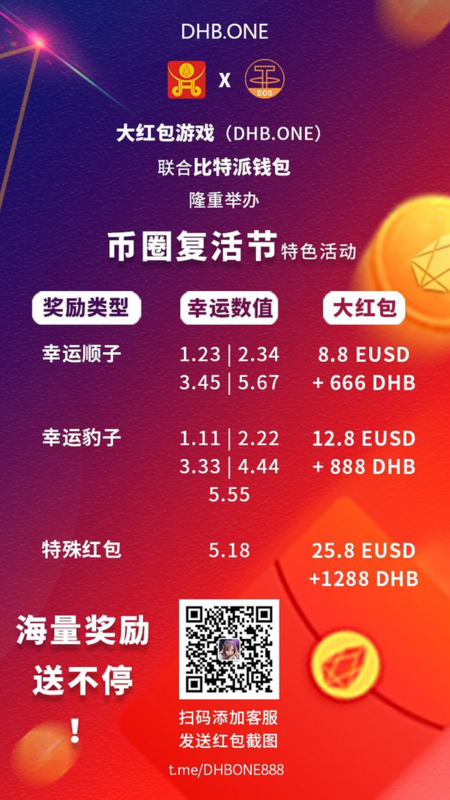 Dahongbao, your Eos Lucky Money！ 传承最经典红包玩法，重现抢包热潮 — — 大红包 once you have these lucky numbers: 1.23, 2.34, 3.45 or 5.67 you get 8.8EUSD+666DHB. If numbers are 1.11, 2.22, 3.33, 4.44 or 5.55, you get 12.8EUSD+888DHB and if it's 5.18, you can get 25.8EUSD+1288DHB bonus! Dbet is a EOS based gaming center with highest odd and payout. 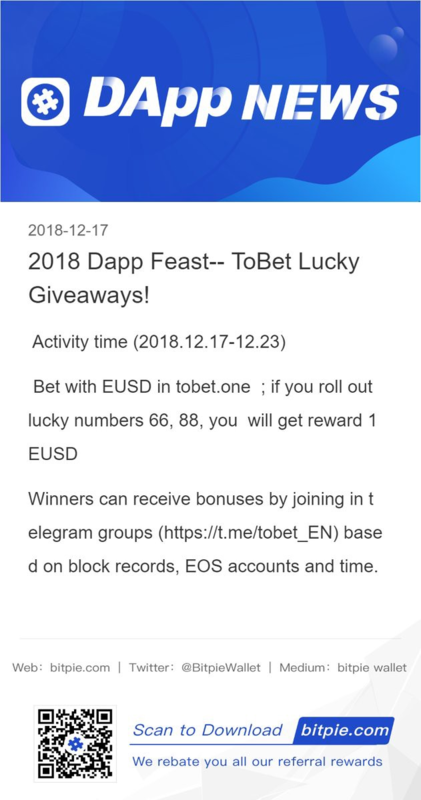 Dbet launched EUSD bet! now bet with EUSD in Dbet Sicbo and Baccadice, when 3 of a kind with 6 appears, a reward will be given. 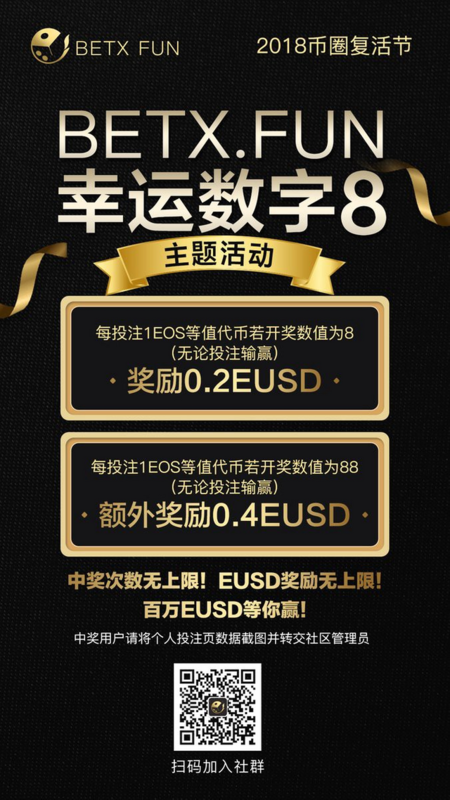 0.88, 8.88, 28.88 EUSD will be given for each 0.1, 1, 10 EUSD bet! At Dec.12 2018, Bitpie launches the Swap Gateways for Stablecoins: EBTC, EETH and EUSD on EOS in Bitpie Wallet. 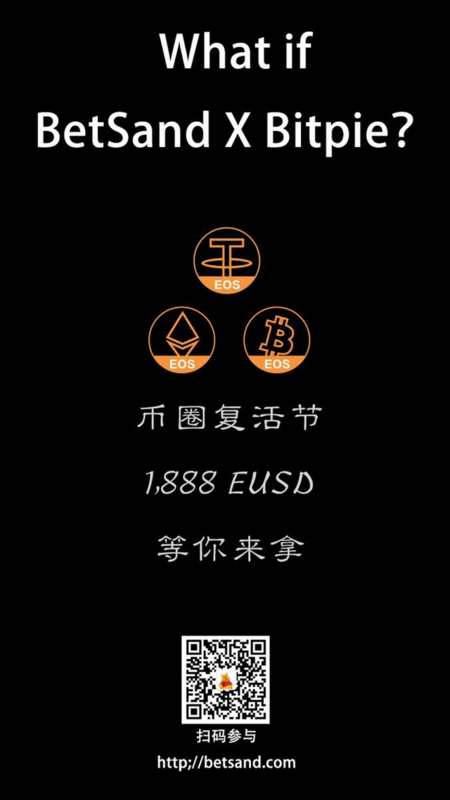 The 3 stable coins are 1:1 pegged to BTC, ETH and USDT respectively. Users swap original blockchain assets to EOS.IO through gateway service so as to utilize them in DApps or DEXs. They could be the game changer in the dapps ecosystem.